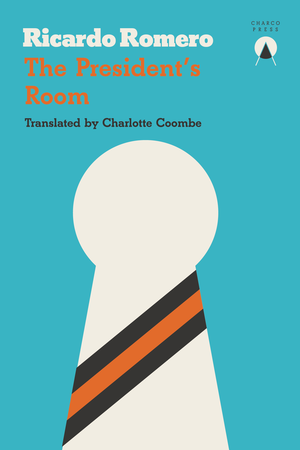 Ricardo Romero’s The President’s Room, the third release from recently founded Charco Press (you can read about the first, Die, My Love, here) name-checks a number of well-known writers on the reverse: Kafka, Calvino and (naturally) Cortazar. Such references are, of course, necessary to entice the notoriously timid English-speaking reader, but perhaps in future we will be able place this novel, and others like it, in a recognisable genre of its own, one which we are at last being introduced to (thanks to wonderful translators like Charlotte Coombe): Argentinian horror. Like Samanta Schweblin’s Fever Dream before it, The President’s Room uses a domestic setting, family relationships, and, above all, a child to create an atmosphere as fearful as the woods at midnight, or the dead-end of a dark alley. Though magic realism was never as cute as some would have you believe, now the magic is as dark as the print it appears in, dressed in the borrowed clothes of the horror genre to disguise the deeper horror which lies beneath in reality itself. The grandfather, whom the boy barely remembers, is vivid in his speculations, suggesting that his memory hangs heavily over the house. Similarly, when at one point the little brother disappears, we sense that every event is the echo of some wider, unnamed tragedy. There is a later hint that something may have happened to his parents. Even when he briefly mentions that he has not seen the girl he likes at school for two months we cannot help but fear something terrible has happened. Inevitably, the president does visit the house – “he was dressed just like when we see him on TV” – observed by the boy, unnoticed by the rest of the family. That Romero from that point steers the novel to a conclusion which is both satisfying and unexpected says much about his skill. The President’s Room, at only eighty pages, can be read in an hour but, appropriately for a novel which turns the haunted house story into a political satire, it will haunt the reader for some time to come. You are currently browsing the archives for the Ricardo Romero category.